Winter in New England is the perfect time to work on a big cozy crocheted afghan, so last fall I took advantage of a great sale on Lion Brand Homespun yarn for an easy afghan pattern to keep my lap warm this winter. It has been slow going though, mostly because of the hours I spent studying biology and writing papers and working out math problems instead of sitting in my cozy chair all evening with my yarn and hook! But that's ok, because when I actually did get to sit in my cozy chair and crochet, I really enjoyed it! I just love how the color blocks line up on the diagonal in this pattern. 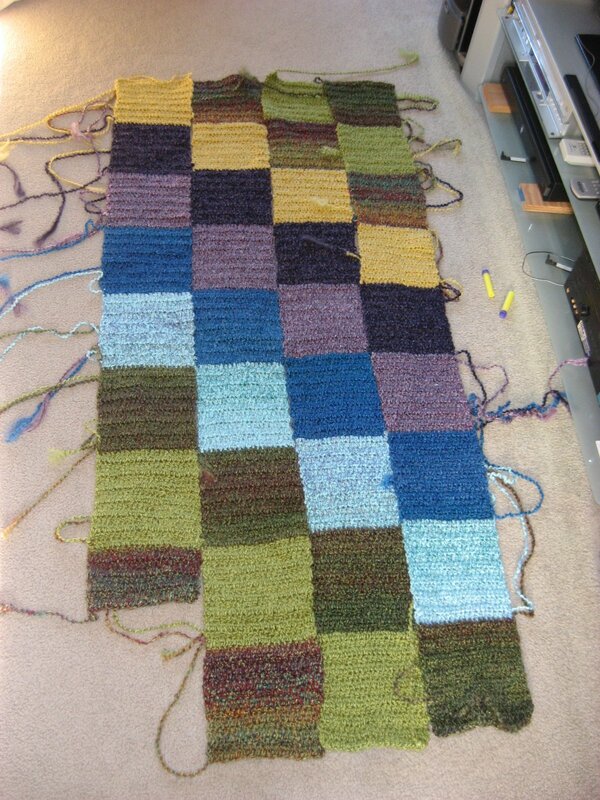 As you can see, it is worked in strips, changing colors every 14 rows. When all the strips are complete, I will sew them together using the long tails I left at the beginning and end of each section of color. Since taking these pictures yesterday, I have finished that fourth strip and have started the next one, so it's over half way finished now. 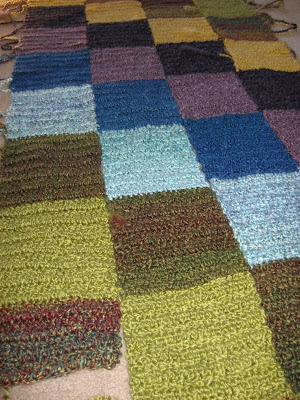 My afghan will end up larger than the one in the pattern because I added one row and one column more than the pattern called for. I like afghans to be a bit bigger than a throw, so I figure other people do too! This one will most likely end up in my Etsy shop when it is finished, so if you love what you see, let me know and you can have first dibs on it when it is ready to go! Next up, I'll show you my finished paper embroidery project for the special event on Friday at the wonderful little school my children go to. And that might be it for a while because school starts up again next Tuesday with my first Microbiology class. I'm very excited about it, but I do miss all my handwork and blogging and keeping up with what all of you are doing out there. It's all good though! I have my crocheting to work on when time permits and lots of things to look forward to when school is over!